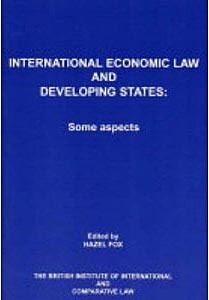 This first volume in the series, 'International Economic Law and Developing States', this title was first published in 1988. The book is the product of the annual Commonwealth students' Conferences organized by the Institute. A Japanese translation is also available. A second volume was published in 1992. Contributors include: Gillian M White, Stephen A Silard, AV Lowe, Hazel Fox QC, Eugeniusz Piontek, Paul V McDade. "Int'l Econ Law & Dev States: Some Aspects"